I decided to do another Art Journaling layout. I can't think of 'Christmas' without thinking of 'Angels' and how they are all around us. 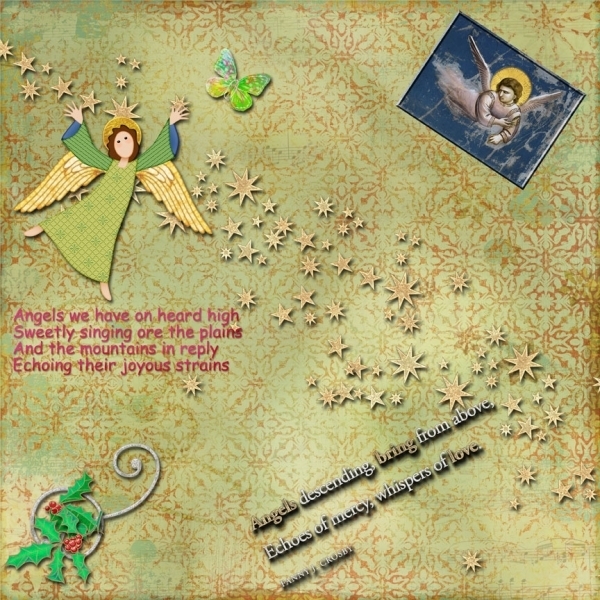 Lyrics to "Angels We Have Heard on High" is a Christmas carol in the public domain. The song commemorates the story of the birth of Jesus Christ found in the Gospel of Luke, in which shepherds outside Bethlehem encounter a multitude of angels singing and praising the newborn child. The words of the song are based on a traditional French carol known as Les Anges dans nos campagnes (literally, "Angels in our countryside") composed by an unknown author in Languedoc, France. I love it… you're doing great AJ pages. I love the angels and the song. Nice layout Carol. Merry Christmas! AAAHhhh.. Very pretty Carol! I like how you used the lyrics as your journaling and your angels are lovely. I especially like the golden stars dancing across the page. Perfect Holiday layout! I especially like the way it looks like the angels are sprinkling stars across the heavens. Lovely page!